Anna is an Equine Behaviour Consultant and Clinical Animal Behaviourist who was previously based in Cheshire but relocated to Devon in 2016. 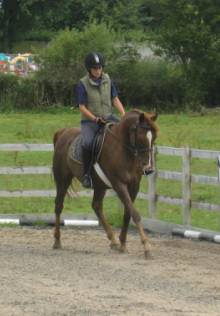 She has been around horses for most of her life, having started riding at the age of five and she has successfully competed in dressage, showjumping and eventing. Throughout her life Anna has been both passionate about and dedicated to animal welfare and spent much of her childhood driving her parents up the wall by bringing home one waif and stray after another! Anna graduated from Liverpool University with a BSc (Hons) in Animal Behaviour in 2004, and later went on to graduate from Newcastle University with an MSc in Applied Animal Behaviour and Welfare, in which she specialised in equine behaviour. Anna has a wealth of experience not only with horses and ponies, but she has also spent considerable time working with donkeys and mules. Since August 2015 she has written regular equine behaviour articles for Horse & Rider Magazine and is a member of their 'Ask the Expert' team and has also contributed to Pony magazine and the Veterinary Times. In February 2018 Anna was accepted as a Full Member of the Association of Pet Behaviour Counsellors (APBC). The APBC is an international network of experienced and qualified animal behaviour counsellors and full membership is gained only following a rigorous selection procedure to ensure that candidates have achieved the highest proven academic and practical standards. Full members of the APBC are also recognised as Clinical Animal Behaviourists by The Animal Behaviour and Training Council (ABTC). This is the regulatory body that represents animal trainers and animal behaviour therapists to both the public and to legislative bodies. During her professional life Anna has worked in a variety of equine establishments, has managed animal welfare establishments both in the UK and abroad and she also provides consultancy for international equine charities. Anna spent a number of years working for the Gambia Horse and Donkey Trust, an equine welfare charity working to improve the lives of working equines and their owners in The Gambia.